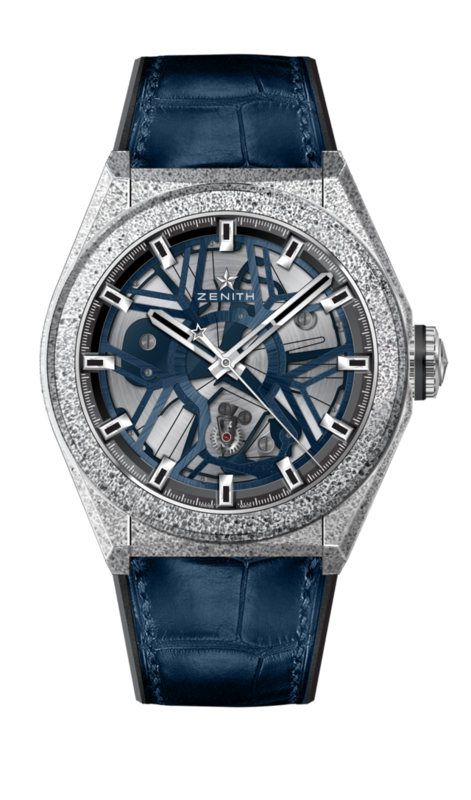 Zenith today debuts the Defy Lab, a 42mm watch with an entirely new movement, ZO 342, utilizing a new 15-hertz Zenith oscillator that breaks away from the basic balance and hairspring escapement designs used by Swiss watchmaking for centuries. In addition, the new Defy Lab is the first watch to be cased with the aluminum composite Aeronith. The blue-hued Oscillator is impossible to miss when eyeing this new watch, and some may initially mistake it as an extension of the usually darker open-worked dial above it. 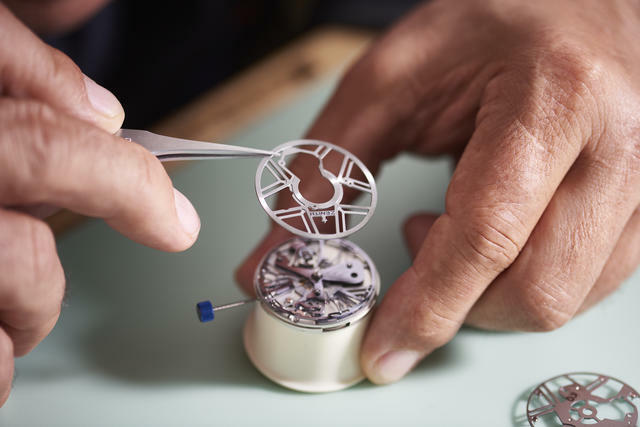 Just below the dial you’ll find the new invention, a 0.5mm-thick single piece of silicon with two components and no mechanical linkages that Zenith has created to replace the set of thirty-one components that compose the escapement regulating a conventional watch. The Oscillator’s vibrating silicon component thus replaces the jewels, lever, escape wheel, balance, pallet fork and other tiny components that traditionally set the pace for the energy transferring from the mainspring barrel to the hands. A look at the silicon Zenith Oscillator and Caliber ZO 342 inside the Defy Lab. Whereas those typical escapement components ordinarily need to be assembled, adjusted, regulated and controlled, Zenith says its new Oscillator needs no lubrication and is not affected by temperature, gravity or magnetic fields. The only wheel adjacent to the Oscillator is also made of silicon and has a specific design and a cycle that, while placed in a location to affect the gear train below, does not exactly correspond to the behavior of a Swiss lever escapement, according to Zenith. Note the Oscillator just below the open work dial. The wheel that affects the gear train below is also made of silicon. With the Defy Lab, Zenith joins a small group of watchmakers working to upend centuries of reliance on the centuries-old Swiss Lever escapement, the regulating mechanism design for movements inside virtually all mechanical watches today. And while the Swiss lever has proven to be a reliable design for years, watchmakers for decades have sought to design more efficient and longer-lasting methods of regulating mainspring energy as it powers a watch’s timekeeping. 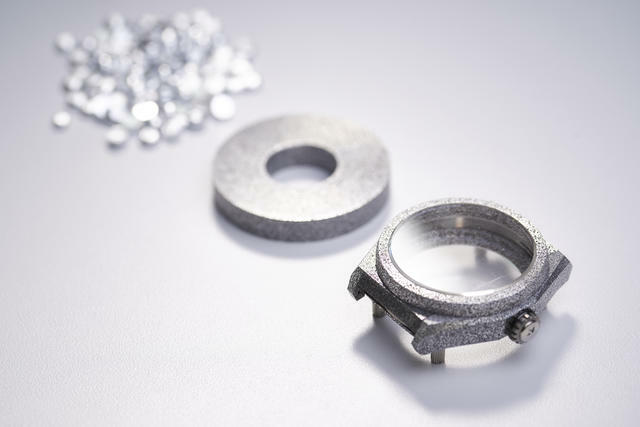 With the advent of lab-produced silicon and diamond-coated components, watchmakers have had new opportunities in recent years to pursue new escapement designs that not only enhance efficiency but need no lubrication. We’ve seen proprietary variations of traditional escapements that apply a variety of constant force devices and lab-made materials that mitigate the need for frequent lubrication. Other alternative or enhanced designs have been presented by Girard-Perregaux, Audemars Piguet, Parmigiani Fleurier, Breguet, Vaucher, de Bethune, Ulysse Nardin and several others. Omega’s extensive use of the Co-axial escapement, initially pioneered by George Daniels, may in fact be the broadest utilization of an alternative escapement design. 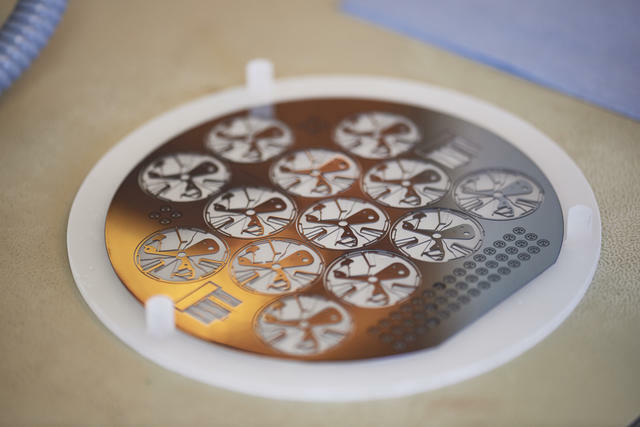 But most of those recent designs continue to rely on a spiral hairspring during some phase of the regulation. As with a few other recent radical escapement re-designs such as the Parmigiani Fleurier Senfine, De Bethune Resonique and TAG Heuer’s Carrera Pendulum and Microgirder, the Zenith Defy Lab requires no such spiral. Created by the R&D Institute of the LVMH Watch Division, led by Guy Sémon, the new Zenith Defy Lab operates at a very high 15 Hz frequency (108,000 vibrations per hour) yet maintains a power reserve of 55 hours, about ten percent longer than the Zenith El Primero, despite operating at three times the frequency. The high frequency results in running seconds hand (centrally located) that sweeps with no noticeable ticks. The back of the Zenith defy Lab. 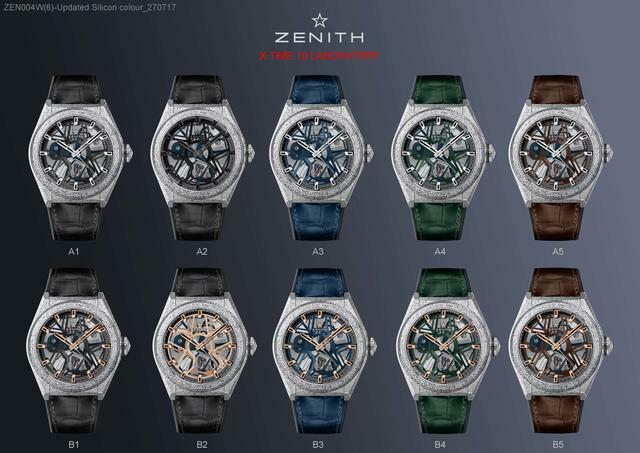 Zenith says the watch’s measured precision “naturally meets the requirements of the ISO-3159 standard and in fact exceeds them. Never has a mechanical watch in the history of watchmaking, through any chronometry contest serial production, reached such a high level of performance and precision.” Zenith adds that the new oscillator maintains the same degree of precision for 95% of its power reserve. Zenith Defy Lab has already received chronometer certification (as displayed by the viper’s head emblem awarded by Besançon Observatory) on behalf of the International Bureau of Weights and Measures. 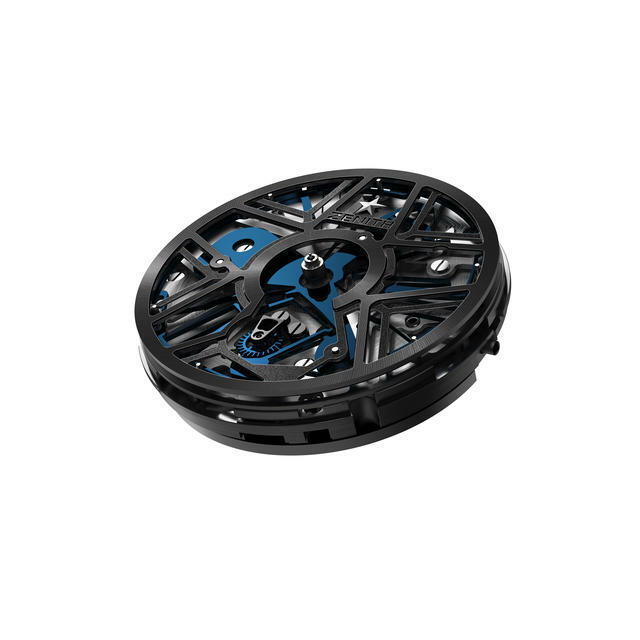 Evolution of the Aeronith case-making process for the Zenith Defy Lab. 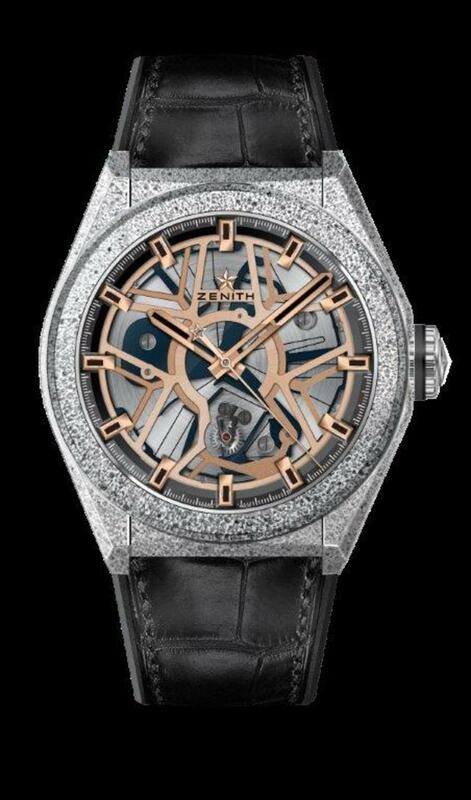 The new technology Zenith has built into the Defy Lab movement is mirrored by its unusual case. Utilizing an ultra-light aluminum composite called Aeronith, the Defy Lab’s case is 2.7 times lighter than a comparable titanium case, 1.7 times lighter than a case of pure aluminum and even 10% lighter than a case made from carbon fiber composite. Aeronith is essentially an ‘open-pore’ metal foam made rigid by a special polymer. 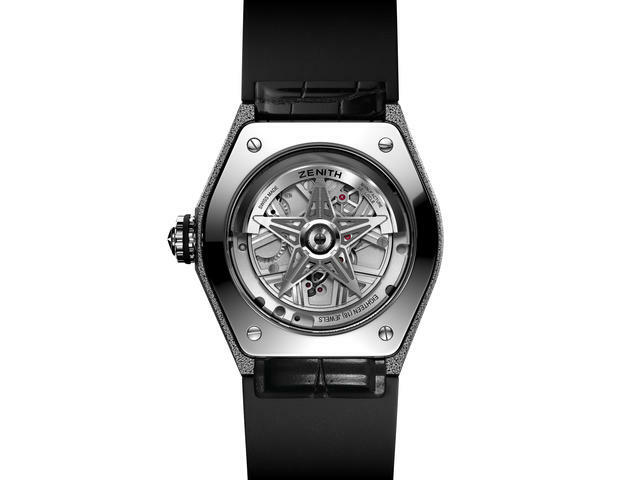 The material’s name (for which a patent has been filed by Hublot’s R&D department under the supervision of its director Mathias Buttet) references Zenith’s links to aeronautical timekeeping. Zenith Defy Lab in full rose gold. The Zenith Defy Lab in blue. 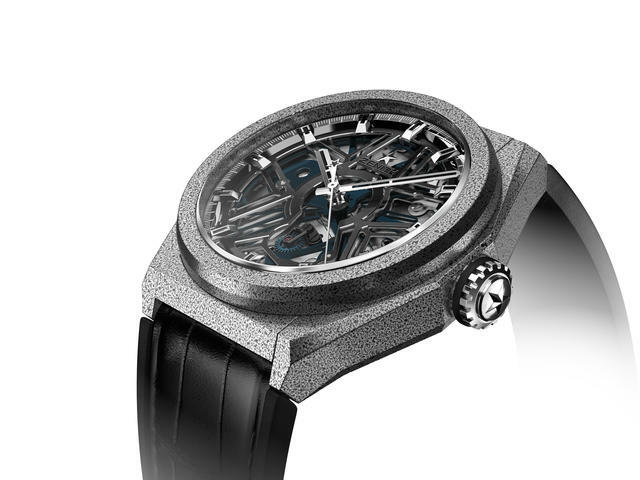 ZENITH Defy Lab debuts as ten unique pieces.